When your life situation changes and/or a new year rolls around, it’s a good idea to revisit the amount of money that is being withheld from your paycheck for taxes. This is done by filling out a Form W-4. It’s been a while since I had to complete a W-4 Form for an employer, but I will try to explain how the W-4 Form works and how to determine those crazy allowances. The Form W-4 is simply a form created by the IRS to help your employer collect information needed to take out the proper amount of federal income taxes from your paycheck. What you put on this form will have a direct effect on the amount of money you get in the form of a refund or have to pay to the IRS next year. It doesn’t have an effect on how much you actually pay in taxes for the year. It just affects how much is withheld to be used towards paying your taxes. Make sense? The form uses a series of questions to determine the amount of allowances you have. Important: allowances have nothing to do with exemptions. “Allowance” is just another semi-confusing term the IRS came up with to mean “a reason to take less from your paycheck for taxes”. Therefore, the more allowances you claim, the less you employer will tax from your paycheck. Like I said above, this is all reconciled at the end of the year, when you file your tax return and calculate the difference between your withholding and your actual taxes due. 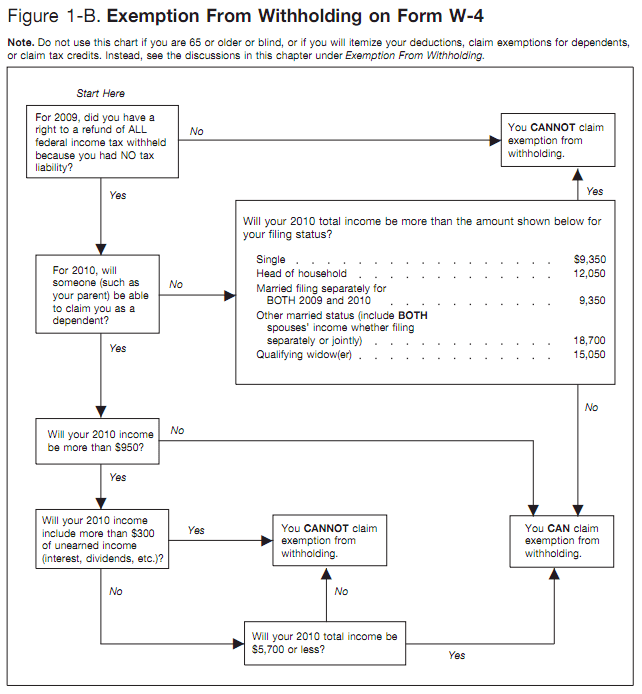 (2) you expect to have no tax liability in the current year. 1. One or Zero Allowances – These people want the maximum taken out of their paycheck. They aren’t worried about giving the government an interest-free loan for a year. They just want a forced savings account and a big refund at the end of the year. If this is you, then regardless of what the true answers to the allowance questions are on the W-4, just make sure that the total (the amount on Line H) is one or zero. 2. The Correct Number of Allowances – Some people choose to aim for zero difference between the amount they have withheld and the amount that have to actually pay in taxes. These people will answer the W-4 Form allowance questions honestly and precisely how their situation dictates. If this is you, then you just need to walk through each of the questions in detail and even consider the additional worksheets on the back for itemized deductions and two-income earners. You will also need to complete a W-4 Form each time your situation changes, not just once a year. A third approach to avoid would be claiming a bunch of allowances that aren’t true. You will end up owing a lot of money come tax filing time and you will potentially face penalties for underpaying. You don’t want to do that. I’ve always been a big fan of the second approach. But that’s just me. I’m a tax nerd. If you have any specific questions about the allowances, use my contact form to ask. I’ve run into trouble in the past when I first joined the ranks of the two-income earners. When was the last time you completed a W-4? What changes did you make? This article is by Philip Taylor from ptmoney.com.